"Near the Johnson Lake State Rec. Area is an excellent little family run RV park. advantages of hookups and showers. Johnson Lake is just across the road." 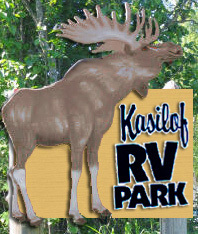 Kasilof RV Park is owned and operated by a couple from Kansas, Don and Jan. They live here in the summer and play snowbird in the winter (farther south than Kansas!). Their campground got a great review in the Churchs� camping book, which is why I called them last night to see if we could get in for four days. We were relieved when Don said yes because we had trouble finding suitable campgrounds on the western side of the peninsula for the rest of this week. 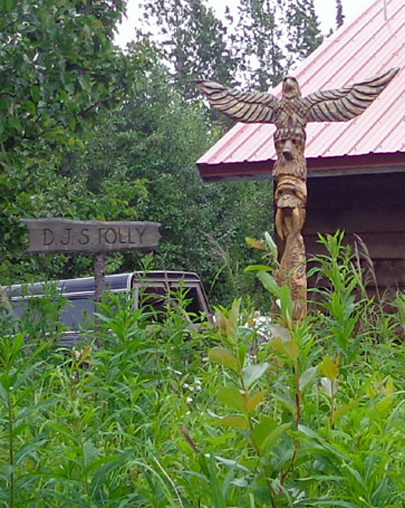 In addition, many tourists are also visiting the Kenai Peninsula now. Campgrounds are full to overflowing in many areas and prices are higher because demand is higher. When we arrived Jan welcomed us and immediately let us know there was a glitch. Uh, oh. Don doesn�t usually make the reservations (as he told me that last night) and he didn�t notice that Jan had already assigned our full hook-up site to someone else on Saturday. 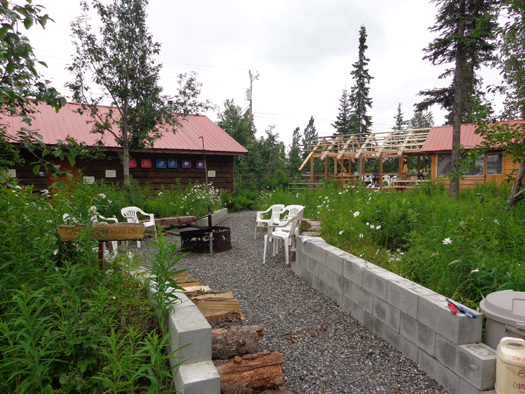 Jan apologized profusely and said we had a couple of choices � to use another pull-thru site with full hook-ups the first three days, then move to the one next to it on Saturday, or occupy a back-in site with just water and electricity (no sewer) all four days. She wasn�t sure the 45-foot back-in site would be long enough for us but said we could park the truck nearby in a site that�s no longer used for camping. People can park their vehicles, boats, etc. in the back row of what used to be RV sites. She offered to knock $10/day off the price for the partial hook-up site, which was attractive to us! Prices are $5/day higher in July for all of the sites here because it's the peak fishing season. 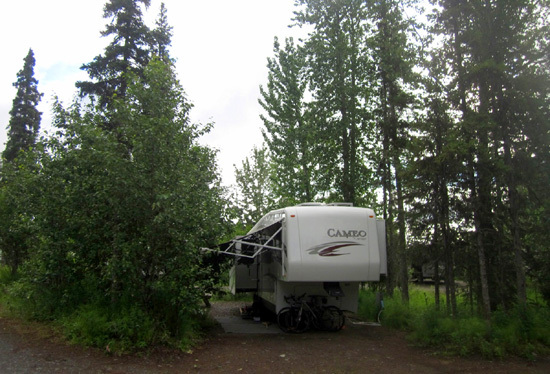 I've already mentioned that most campgrounds on the Kenai Peninsula increase the price in July because of the heavy demand for sites. Since this was Don's mistake, we benefited in the long run. And we get it for just $25/night, a great price for a private campground on the peninsula in July. The $40 (+ tax) refund was credited promptly to our credit card. We checked out the nice bathrooms and showers, laundry, rec room with WiFi and TV, and other amenities. It�s a nice little place that should offer us peace and quiet compared to the larger and very busy campgrounds on the main roads that are closer to prime dip net and pole fishing for salmon. 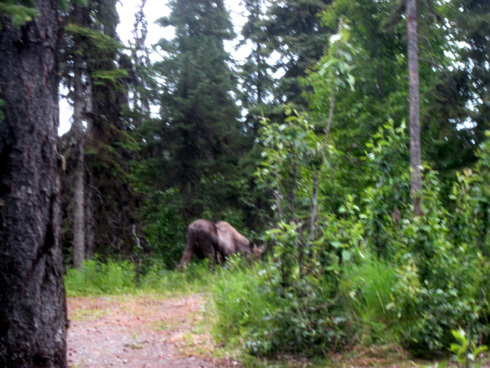 There are moose pictures on the campground website, entry sign, and ad in The Milepost so we knew to expect them. Johnson Lake is right across the road from the campground. The pull-through RV sites have a view of it. The moose frequent the lake, then return to the woods through the campground. 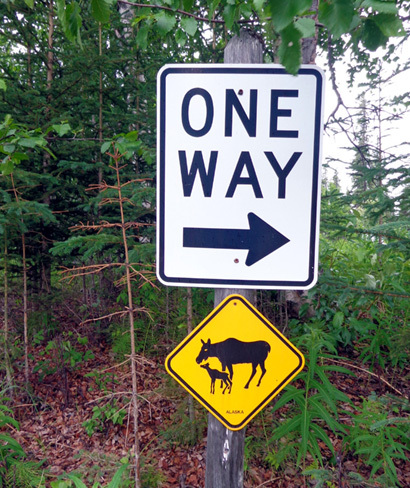 I like the little moose mama and baby sign in the campground. We stayed at the campground all afternoon and evening, just relaxing after six busy days in Seward. We have a decent phone and personal MiFi signal, get the campground�s free WiFi OK at our site (not real strong, but it�s free), and receive several TV stations clearly. That�s a nice surprise. Since we aren�t near a large town and are off the Sterling Hwy. I didn�t expect much in the way of reception for any of those things. After supper we walked around the campground some more. 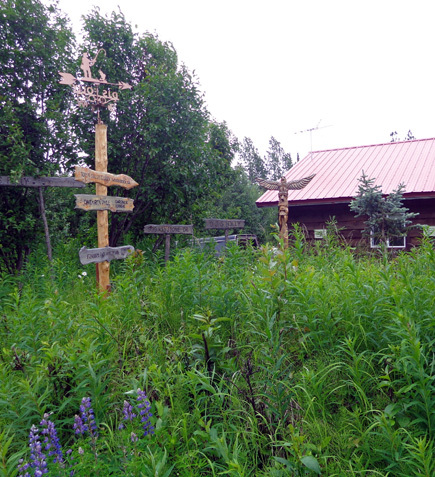 There is a communal fire pit behind the restroom/laundry/office building and next to it in the tall grass and wildflowers are several signs that remind us of the Signpost Forest in Watson Lake, Yukon Territories. He told me his family and friends originally thought he was a little crazy to buy the place but it has worked out well for him and his wife. 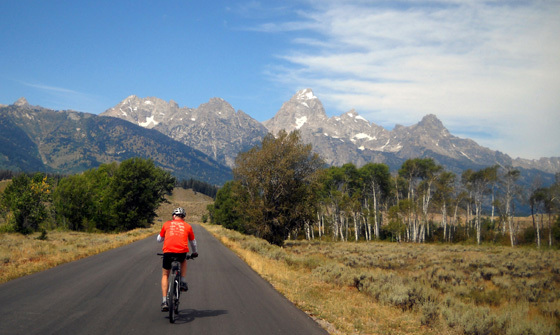 They have the best of several worlds, he said -- maintaining a home base bear family and friends in Kansas, snowbirding in their RV farther south in the winter, and having fun managing the campground in Alaska during the summer. 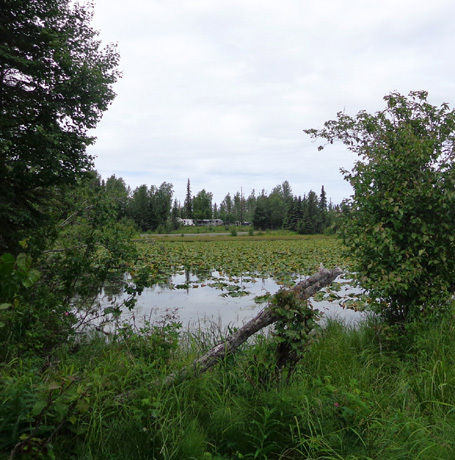 We will be here four nights unless something compels us to stay on the west side of the Kenai Peninsula longer. We'll visit points to the north and south on day trips. I didn't get over to the lake across the road until two days after we arrived at the campground. I took these pictures then -- on a nice sunny afternoon. I found only a short trail along the south end of the lake but it was rough and I went only about half a mile. 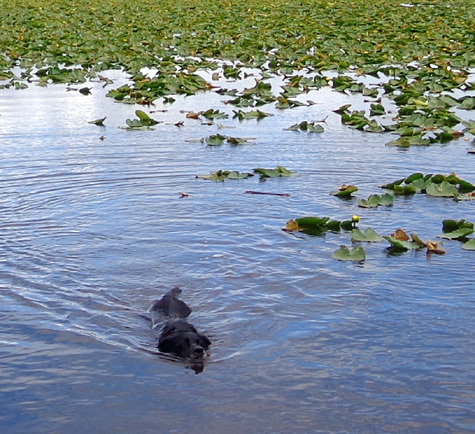 Cody loved getting in the water and I enjoyed the scenery. That day Jim rode his bike back the road toward Tustemena Laket. 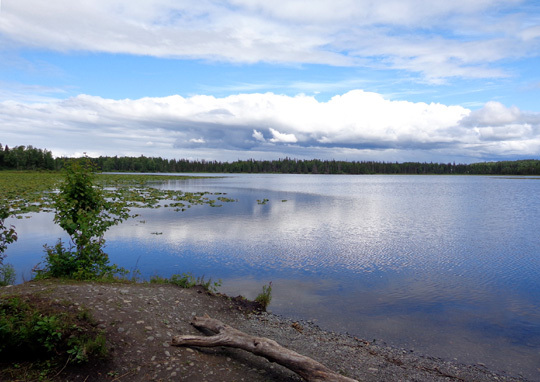 Johnson Lake is pretty but it is much smaller than huge Tustemena Lake, the biggest lake on the Kenai Peninsula. 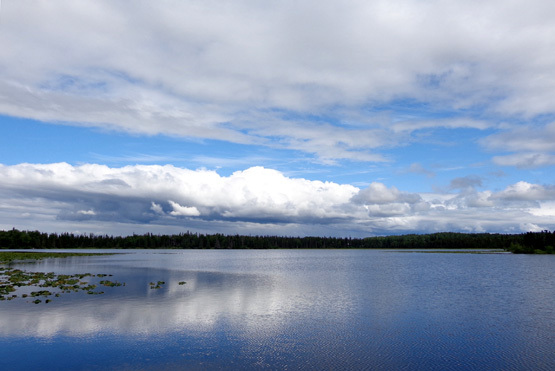 The Kasilof River flows about 15 miles from Tustemena Lake to Cook Inlet. It�s another of many popular fishing rivers. 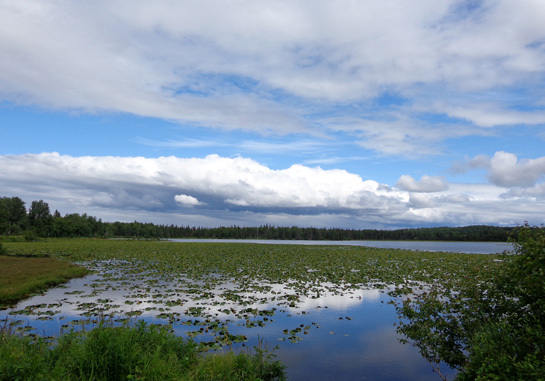 There are numerous lakes and streams in this state and they all seem to be popular fishing venues!